Microsoft must have thought it had pulled off a nice piece of product placement when it gave CNN election commentators a bunch of Surface Pro tablets to help with their coverage. CNN dutifully covered its desks with the devices, resulting in a series of proud tweets from Microsoft fans. There was just one small problem, noted by GeekWire: a closer look revealed that hidden behind the Surface tablets were the iPads that commentators were actually using. In one case, the commentator was actually using her Surface tablet as a stand for her iPad. Microsoft, which was last year forced to write down $900M on its ill-fated tablet, has frequently taken pot-shots at the iPad, running a series of misleading Surface tablet ads attacking the iPad (and iPad mini) before more recently turning its attention to the MacBook Air. Switching overt advertising for product placement doesn’t seem to be working out too well. So, er, using the Surface as a dumb monitor while actually doing stuff on the iPad, then. Didn’t Microsoft tout the famed multi-tasking abilities of the Surface while claiming the iPad was only a single-use device … ? The total number of Apple devices sold will equal the number of Windows PCs by some point this year, predicts Asymco’s Horace Dediu in an interesting piece of analysis. The dark shaded area compares all Apple hardware – Mac plus iPad plus iPhone – with Windows PCs, and shows that by last year there were only 1.18 more Windows PCs than Apple devices. It’s of course a somewhat artificial comparison, as Dediu is including iPhones while excluding Windows Phones and tablets, but given the very limited success of Windows mobile devices to date, correcting that wouldn’t change the patterns too much. If ever there was a simple visual to illustrate just how slow Microsoft was to wake up to the shift into mobile, it’s this one: a full 70 percent of Windows users also own at least one Apple product. 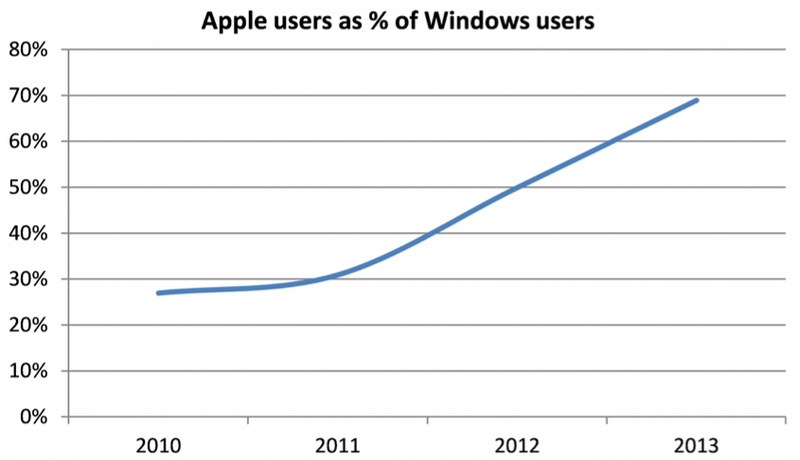 While there will be some joint Windows/OS X users in there, the majority of them will be people with Windows PCs and either an iPhone, iPad or iPod.